Easy run today. Got up in the morning and it was snowing. Just had a dream about winning some small 10 K. For a prize they were going to give me some fairly large contraption of no practical use created for a special project by the local high school students. I felt bad I had to tell them I could not take it. With only 1060 square feet in my house, 4 children, and one more on the way, there was simply not enough room. My wife Sarah tells me my dreams are boring - too close to reality. As a case in point, a few nights ago I dreamt about Hobie Call winning the Hobblecreek Half-Marathon with the time of 1:03:22. He was disappointed afterwards because he was shooting for 1:02. Well, Hobbie indeed could have run that time - he ran 1:05 in that race in 1999, and a high 1:07 in the Great Salt Lake Half-Marathon in 2002, which my predictor converts to 1:02 in Hobblecreek. And he is the type of guy that sets high goals and tends to be disappointed when he does not get them. 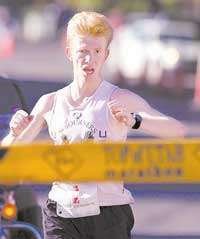 I also had a dream before the St. George marathon in 2003 that the race had already happened Trevor Pettingill won it with the time of 2:20:04. In reality, Trevor ended up winning with the time of 2:20:35. Dreams forgotten and after a short scripture study I went with George and Eric on the Slate Canyon Loop. We did 4x400 at around 1:20-1:25 pace in the middle. Then dropped Eric off and finished the 10 miles with George. Maybe one day George and I will convert Eric to the blog religion. Right now he is doing it the non-tech way - Runners World book. Did my "always on the run" miles in the afternoon, as well as separate runs with Benjamin and Jennifer to hit the total of 14 miles for the day. I'll get my 9th grade Geography students working on a smaller contraption so you can be more satisfied with all your winnings. Interesting you mentioned Trevor Pettingill, I ran with him in the fall of 1998 at BYU. He actually was one the guys I had the most in common with. It was a different team. Awesome freshmen, Bryan Lindsay, Nate Robinson, Matt Adams, and older married guys Matt Paulsen, Randon Richards. At times I didn't feel like I fit in with the group, but I did get along good with Trevor. I wish I had more dreams about me winning races. I can only recall having one running dream back in 1999 where I ran a 10k on the track at BYU in 28:30. I remeber being pretty happy with winning the race with that time. I don't know why you had to bring up Hobbie Call. I still have nightmares about that guy stopping off for a soda and still beating me by 5 minuets. He's a machine. I ran a 10k with him this fall...I got sick and vomited...He won the race by FOREVER over the next placer. That was a bad day. Sasha I'm considering one of the two: Deseret News Marathon in July or the SLC marathon in June. If I want to peak by the St.George in Oct which race would be most benificial?